From the Hancock County Courthouse, take Hwy 22 southwest for 7.2 miles to Devereux. Turn right (at the backwards fork) onto Main Street. Go 0.2 mile to the dead end and turn left onto Jones Chapel / Devereux Rd. Go approximately 4.5 miles. The cemetery is on the right side of the road. Cemetery is approximately 1/2 mile north of the intersection of Carrs Station Road and Jones Chapel / Devereux Rd. Graves numbered 200 or higher have been added since the original survey and are largely based on obituaries. 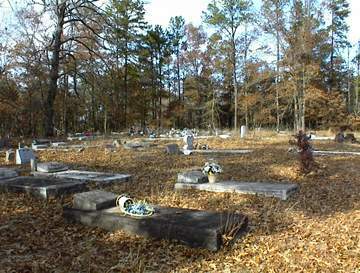 They are believed to be somewhere within the cemetery. Rocks for headstone and footstone. Handwritten information difficult to read. Rocks mark head and foot of grave. Headstone and footstone mark grave. Until we meet again. Farewell. Born 1902. No death date given. "Evarsimmons" is written as one word on slab. In same grave with Rosalee and Leona Bundrage. Only one date on marker. In same grave with Joseph and Leona Bundrage. Only one date on marker. In same grave with Joseph and Rosalee Bundrage. Only one date on marker. Father. God Is My Refuge And Strength. Slab broken across middle. Difficult to read. Slab broken across middle. No dates. Name written in cursive writing: R^LL^A Walls. Bricks mark head and foot of grave. Peoples Funeral Home tag. Year of birth and death date illegible. Away With God. No birth date. No birth date. Rocks mark head and foot of grave. On same headstone with Samantha Walls. On same headstone with Tuesday Walls. Rocks mark head and foot of grave. No last name or dates given. Georgia PVT 316 Service Bn QMC. Year of death not clear. PVT 37 Cons Co AS World War I. Only date "Aug 2.89" written by hand on slab.